India has some of the lowest train fares in the world, and that’s good. It’s also good that India makes travel affordable to all classes of its people. In the U.S., if you’re poor you’re basically out of luck if Grandma lives on the other side of the country–you probably won’t see her very often. When we boarded the train in Madgaon Station for Kochi (old Cochin), I was still suffering the effects of the Shingles that almost caused us to cancel our travel two weeks before arriving in Delhi; I had been successful at cutting back from three to two, then finally one pain pill a day until I could pitch them altogether. If only I hadn’t fallen into that drainage ditch in Goa! As it happens, once I boarded the train I didn’t have to move much for the next 16 to 17 hours. Good thing, too. There wasn’t much room to move about as you’ll see. So I just popped another Ibuprofen to my pill regimen and went limping onward. 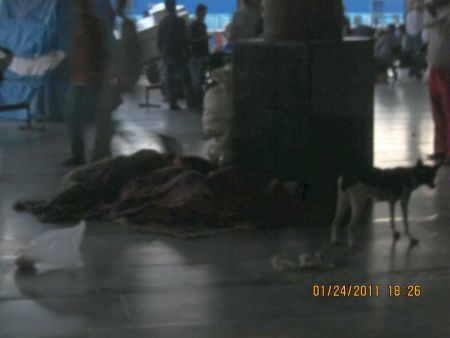 In the station we saw numerous children begging from locals and tourists. We wondered if their parents knew their children were out begging early in the morning rather than being on their way to, or in, school. After several conversations with others regarding them, we learned that it’s not at all uncommon that whole families live in public areas like train station platforms. Not only do they know their children are out begging, they probably sent them. Even though an education is provided by the government free to all children, begging has become a way of life for many of them. Without understanding the need for formal education, there’s little hope these children will be able to break the cycle. We saw this throughout much of our journey. The sleeping figures huddled along the platform here (below) are all women who could be anybody–passengers, workers or beggars. Trains accommodate commuters as well as tourists. These are probably some of our fellow passengers waiting patiently on the platform waiting area. They may be on their way to work in the next town or village, or they may be off on holiday or a pilgrimage to an ancient temple further south. The five of us–Raj and his wife Vasanthi, Hubby and myself, and our friend ML–left the Casa de Goa before daybreak with breakfast sandwiches of egg omelets the kitchen staff had wrapped in paper napkins. 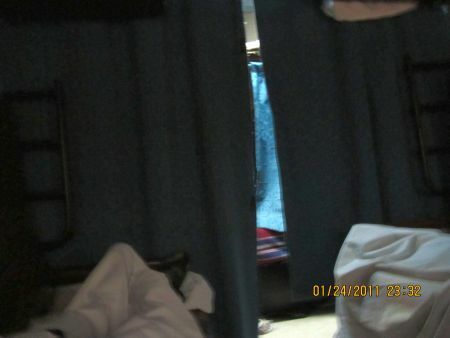 We wouldn’t get to our hotel in Kochi until very late, around 10:30 that evening, and we’d be fed on the train. I was looking forward to “lovely views of the sea and mountains” as our train traveled through picturesque Western Ghats. Ah, I’m glad I enjoyed my imagined train journey so much . . . because I would soon learn that some train journeys can be fun, but some may possibly make you loco, especially if you’re already half-crippled. We were fed twice or thrice, can’t remember since all the meals looked and tasted the same (think airline food steerage class). Here’s Hubby looking very cozy as he tries to catch a few z’s. 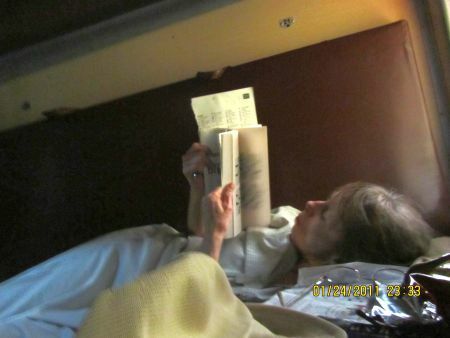 Was it just me in my half-dead state, or did that berth resemble a coffin from that angle? Using the other berth as a seat, ML and I sat opposite him reading. Raj and Vasanthi are sitting together–just outside our cubicle–in Raj’s side-berth just south of the couple across from us. The toilets are located at the end of each car–two, one western style and one Indian style–at each. There’s little ventilation in there, and we learned the hard way that they can get very stinky at times. Now it’s my turn to lie down. That’s my feet wrapped in a light cotton blanket (bottom left) provided by rail service. The dark blue curtain just beyond my toes is drawn for privacy from the two side berths across from us occupied by a previously boarded older couple. The striped bedding at the bottom of the lighter blue curtain peeking through the slit gives a glimpse of the walking aisle–which everyone in the the car must walk down to get to the toilets at either end. Every now and then I’d get that feeling you get when someone’s looking at you. When I’d glance up, I would see the lighter blue curtain pulled aside a tiny bit and caught the woman staring at me. Immediately she’d whip the curtain closed. Since ML and I were the only Americans in our car, we had to behave. The impression we made would no doubt color how this couple and anyone else on the train would view all Americans. Looking out the windows at what we were sure had to be amazing views of the sea and mountains didn’t help after all. Not only was our window covered with bars, the dust covering was much too thick to see through. Because she’s an experienced traveler, ML had brought along several mystery novels, and cross-word puzzle books. When we tired of reading the books and kindle we’d brought, she’d tear out pages from her puzzle books to share. Seventeen hours (supposed to be 15, but there were several delays) in so small a space is a long-g-g-g-g-g time! In our early morning wanderings at the train station back at Madgaon Station, I took this picture because ML and I were so amused by the sign’s mysterious wording. We wondered who these loco pilots and guards were. What did loco pilots and guards look like? The men through the glass door looked sane enough. Now, as I look back, the experience behind me, I wonder if I might have the explanation we were looking for all along. Maybe those loco pilots and guards were railway personnel–engineers and security?–who’ve simply traveled one time too many on their own second class sleeper trains. It was almost midnight (as near as I remember) when we finally arrived at our hotel in Kochi. Sometime during the long hours on the train, Raj and Vasanthi got together with Hubby and talked. It turned out they’d all agreed it might be a good idea to cancel the three similar train journeys we’d already booked for the rest of our visit in favor of air travel when possible as this was not the best of train journeys for both the Americans and the Indians. I was so relieved I picked up the ‘phone in our room as soon as we checked in, and dialed all-night room service. I ordered a huge fudge cake smothered in chocolate syrup and whipped cream with a maraschino cherry on top which was delivered in 10 minutes. In spite of lingering shingles pain plus the added burden of a humongous leg injury, I indulged in my favorite chocolate medical remedy and went to bed. Life was still good. I hope I haven’t bored you with our less than colorful train journey. I promise, due to my protective Indian family, there won’t be any more trains on this journey. This entry was posted in International Travel, musing and tagged cochin, Goa, India, International Travel, kochi, western ghats by Alice. Bookmark the permalink. Nah, not boring. I’m just glad I wasn’t on the train with all of you! 😆 Better having fun with us than by yourself! 😀 Just kidding, Colleen, I know what you mean! It was rather claustrophobic. But it makes you think what it might be like in a prison cell, doesn’t it? Wow!!! Doesn’t look like my cuppa either! However, a sinful dessert is an appropriate panacea for the ordeal! Everyone should keep such medicine on hand for any kind of ordeal! My freezer’s almost always stocked. It all adds to the colour of the place. My sentiment exactly. A little blah on the plate makes everything else taste good. I’m with you on the chocolate medicine. Ice cream has been my favorite panacea since I’ve been suffering with my implant. My nastiest train experiences have been here in the US. But this sounds like the worst. Too bad. I see you have found the magic secret to leaving me a note…or two or three. Please let me know what you changed so we can get Ruthe back to noting. One old notes now says she can leave comments from her computer but not her phone, so there are design specifics that effect you all when you try to leave notes. Now I will go check my mail. You were very diplomatic in describing the toilets on the train. As I recall, we nearly had to be revived. Peeeyuuu!